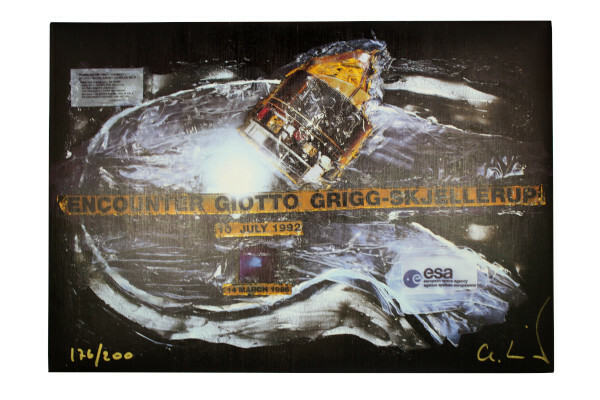 This limited-edition print celebrates the space probe Giotto’s encounter with the comet Grigg-Skjellerup on 10 July 1992. Giotto was the European Space Agency's (ESA) first deep-space mission. Its destination was primarily Halley's Comet, which is a short period comet visible from Earth every 75 years. The spacecraft was not expected to survive this encounter, but amazingly Giotto's instruments remained intact enough to extend the mission to intercept a second comet, Grigg-Skjellerup. Giotto flew 200 kilometres from the nucleus of Grigg-Skjellerup, which at the time was the closest comet fly-by and the first time a spacecraft visited two comets. To commemorate this achievement ESA asked German artist Charles Wilp to create a piece of artwork that could be reproduced as mementos, art prints and posters. Wilp created a piece called ‘Homage to Deep Space’ using only materials used in space technology, such as Capton film, which was then sealed in Stycast. The original artwork measured 180 cm x 120 cm. It represents the comet Grigg-Skjellerup with its nucleus and two tails and the Giotto spacecraft. 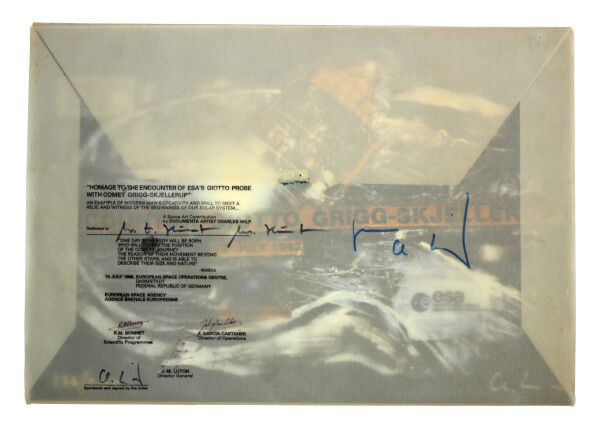 The print we have at the National Space Centre is one of 200 limited-edition prints of this artwork and is signed in gold pen by the artist and presented in an envelope signed by senior figures at ESA. Charles Wilp was a German advertising designer and artist. He had family connections to Wernher von Braun and Rudolf Nebel, both important figures in German rocketry, who influenced Wilp’s interest in aerospace. He studied under Man Ray in New York and counted Andy Warhol, Yves Klein and Joseph Beuys as personal friends. Wilp was the first artists to make work using space age materials and he even had work flown in space on the Russian space station Mir. Wilp also made several zero-gravity flights himself and referred to himself as an “artronaut”.